Easy Snowflake Centerpiece - My First Tutorial! The Chrismas ornaments have been put away for a few weeks and while I really enjoy the holidays, especially the decorating, I always find it a relief to put them away. There seems to be just a little more room to breathe. But, now it's the middle of January and I'm feeling like there needs to be a few more seasonal things about. But what to do for a snowy, and so far rather cloudy, bleak month? 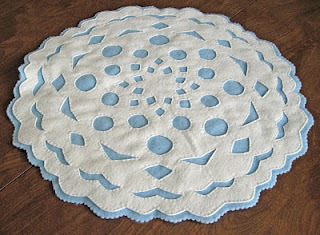 I decided to make a felt table mat and snowflakes were my inspiration. After all the holiday making that goes on, I wanted to keep the project simple and using felt seemed to be the perfect fabric - no seams to finish - yay!!!! 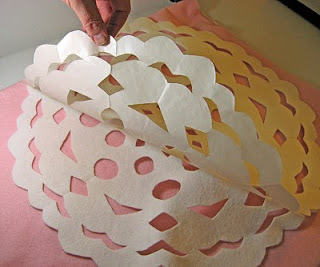 Here are the directions for my Easy Snowflake Table Centerpiece. 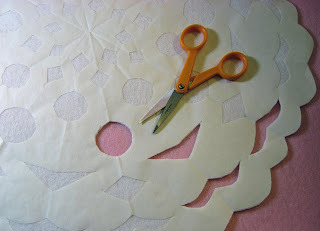 I began by using paper scissors to cutting a square of freezer paper (approximately 16 inches) and folded it into sixteenths(fold in half, then in quarters, then in eights and finally one more fold will give you sixteenths) and cut out a snowflake. I did this just like we did when we were kids in grade school. I then opened it up to see what I had created. You might want to cut out several to get one you really like. Now, this is sort of the tricky part. You are going to iron the freezer paper onto the white felt. You place the freezer paper shiny side down and using a medium hot iron with NO steam begin to iron from the middle and work your way out smoothing down the paper as you go. Leave the iron on the paper only about 5 seconds. You dont want to scorch the paper or the felt. 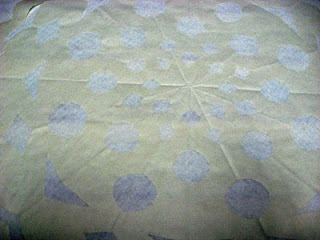 Now cut around the outside edge of the freezer paper. At this point, if you want to use wonder under or a fusible applique material, you should use it now fusing it to the felt on the opposite side as the freezer paper, following manufacturer's instructions. Leave the freezer in place while you do this. Next I cut away the felt on the inside where it was showing through the paper. 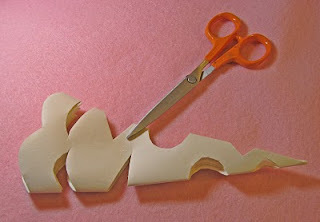 This is a bit tedious but if you have a pair of sharp pointy scissors it makes it really easy. I have a pair of Fiskars that I believe are called micro point. They are available at most craft and sewing stores for about $10. Well worth the investment...I use them for tons of stuff. 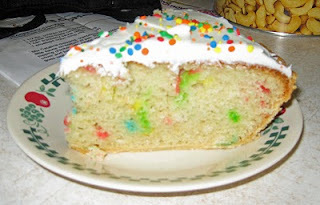 Now, carefully peel off the freezer paper. If you get this off in one piece, which I found pretty easy to do, it can be used more than once. Cut a piece of blue felt about 2 inches larger than the white snowflake. 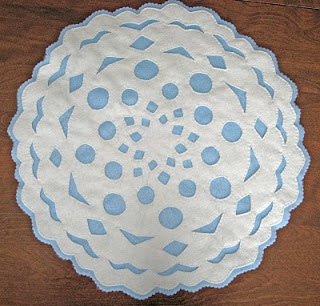 Center the snowflake on the blue felt and carefully pin the snowflake on. 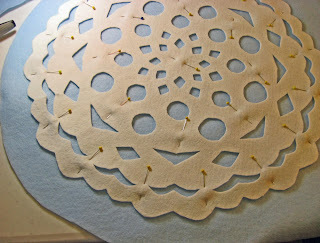 Use lots of pins so the snowflake doesn't shift while you continue to work on it. 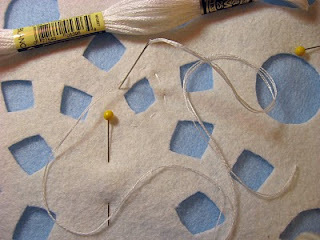 Using white embroidery floss, stitch around each opening. 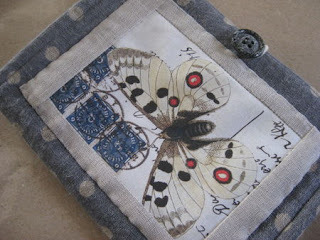 Now, I know this sounds tedious, but I rather enjoy hand stitching and it really didn't take me very long. Another option if you do not want to do all that stitching is to use Wonder Under or your favorite fusible applique material. You could also glue it, but I was afraid both of these applications would leave the fabric feeling stiff. Lastly I trimmed around the edges with my sharp pointy scissors and then for fun used a scalloped pinking shears to finish it off. Another idea I had was to cut snowflakes about 4 inches across and make coasters. What a great gift idea to lift those mid-winter blahs! 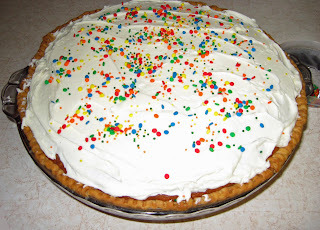 Is It a Pie or Is It a Cake? 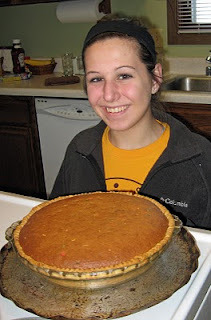 One day I asked my niece, Maddy about her favorite kind of pie. She hesitated and said if it could have cake in it, that would be her favorite. So, today we set out to make a cake pie. I put a pie crust in a pie pan, Maddy whipped up a confetti cake, we poured it in the pie shell and we popped it in the oven. We worried a little that it would spill over the sides. It didn't but it took a little longer to bake. The results...well not that great, but we had fun with our experiment. I found a bunch of blogs I wanted to search through so bookmarked them. As blogs and the internet go, one blog led to another, then another and then another. And I found gold! One of my starting points was Glitter and Grunge a website that has member artists and a blog. 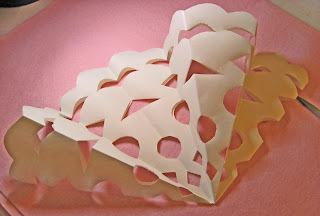 The blog had some links to French crafting blogs. Anyway, to make a long story short I happened upon Angel Melie a beautiful space with lots of wonderful things to look at. It is written in french, but I think the eye candy is well worth the trip and the mind of a maker can always assess how something is made and do it in your own way. I was interested in French blogs because I love the magazine Marie Claire Idees. It is a quarterly that is just filled with the most beautiful photographs, craft ideas, beautiful food and a very different sensibility than American magazines. It too is in french but I highly recommend a look. I have happened across it in Barnes & Noble and Borders. It is a little pricey, so depending on how prosperous I feel I sometimes just look through it in the store. If I'm feeling flush and buy it, I always go through it and take out the inspirational pages for my idea files. One more thing...I'm working on my first tutorial and I'm really excited about it. Stay tuned! 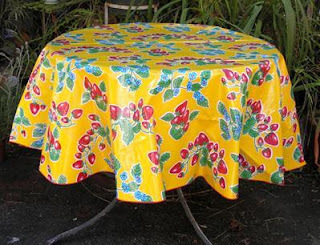 I have many friends named Susan and one of them, but not the one from the previous post, sent me an interesting Curbly link on making oilcloth. We've all seen the cute prints that lunchbags and tablecloths are made of. Well here's the link that describes how to make your own and ideas for how to decorate it the way you want as well. Hey all you crafters out there here is a site I must share with you. 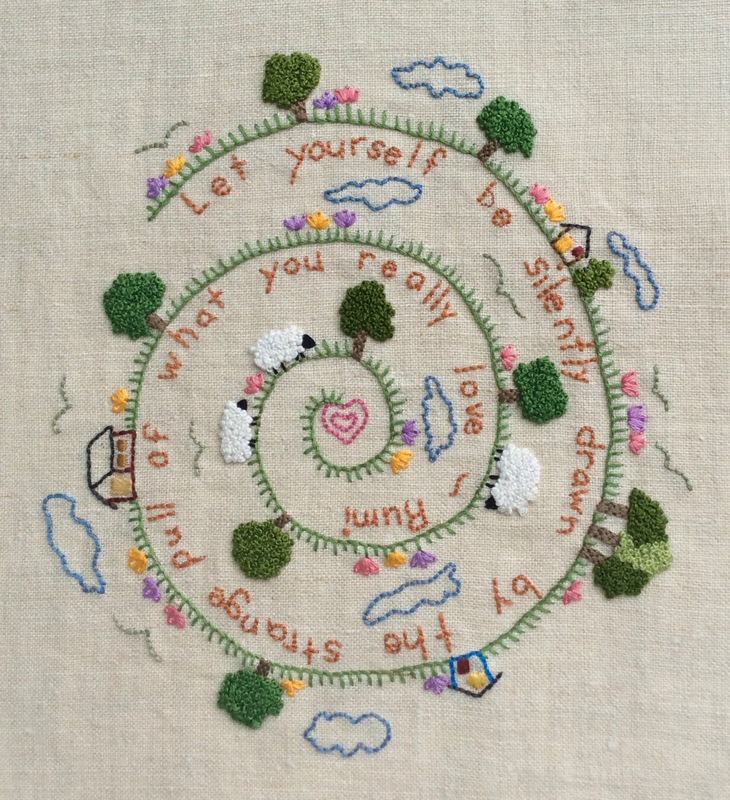 My friend Susan at Dandelion Factory sent me the link...it contains the top 100 stitching tutorials of the year. Need I say more? Click to go to The Long Thread, curl up with your laptop and start surfing. Happy New Year Everyone!!!! I am so happy that a new year and decade is upon us. It is time for new goals, experiences and fun. Let there be lots of fun!!!! 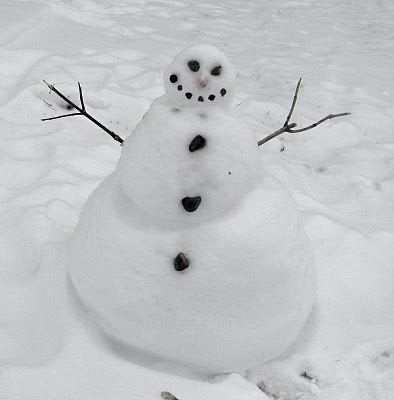 To start off the new year with a giggle, here is a tiny snowman that our neighbor kids made. He is all of a foot tall and I laughed out loud the minute I saw him.